The new year started with plenty of good cheer. 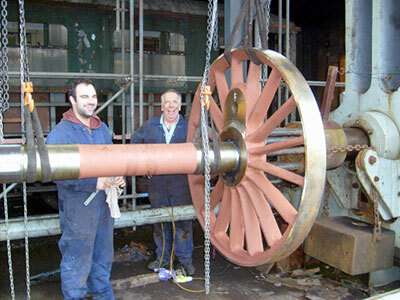 The first cylinder has been cast and stress relieved and is now at the Williton workshops of West Somerset restoration. Casting of the second cylinder at the Chard works of Cerdic Foundries Ltd is expected shortly and this will follow the trail of the first one. Once the pair are both at Williton machining will start when this job is programmed into their work schedule. 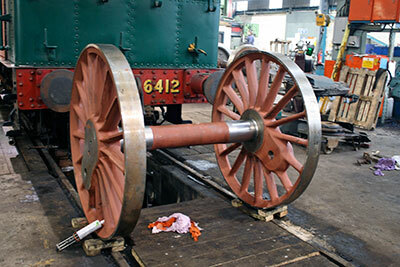 Meanwhile at the Buckfastleigh workshops of South Devon Railway Engineering 82045's driving wheels are now fitted on to their axles. Manufacture and fitting of keys is underway. Arrival of tyres from South Africa is expected imminently and they will be fitted to the wheels as soon as convenient. At Bridgnorth machining of the horn faces of the cast steel axleboxes is proceeding well and the next stage will be the machining of the semi circular base for the bearing shell. A sample of the latter has been cast and the remainder will be done as soon as we can confirm all is well. Another machine shop job in progress by our team is the machining of the anti vacuum valves (also known as snifting valves). The cross stays have been fitted to the chassis and are looking smart in new paint. The cast steel spring brackets were deliberately not pre-drilled. Work is now proceeding on aligning them in their correct places on the inside of the main frame plates and drilling through into them from the outside of the frames. 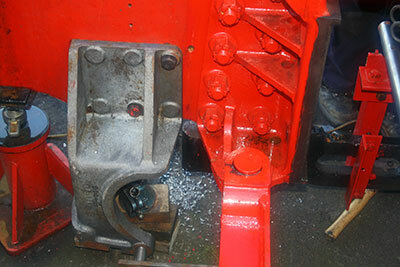 Fabrication of the spring shoes which attach to the spring brackets is underway off site. Just a reminder that the Trust's fourth AGM will be held, as usual in the upstairs Lecture Theatre at Kidderminster Railway Museum, on Saturday 5th April at 2.00 p.m. All are welcome - you don't have to be a member to attend - and we are looking forward to what should be another pleasant, positive meeting, with plenty of good news to share with you. Constructive suggestions are always welcome, so come along and have your say. Look out for quite a bit about 82045 in the next issue of SVR News, due out in early March, which features the launch of the first stage of the Boiler Appeal. The magazine will include an appeal leaflet and Freepost envelope insert, as well as an article about the project and an endorsement from Nick Ralls. 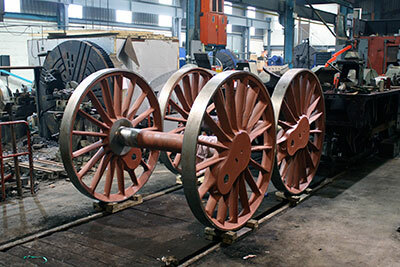 We hope that this will be the last major appeal for the new loco, and we are keeping our fingers very tightly crossed that it will be as successful as the Wheel Appeal. The boiler account already shows a healthy balance, in advance of the "official" launch, and it is essential, for the rapid completion of 82045, that we maintain our momentum in raising funds. Please get in touch with Barbara if you would like to contribute - don't wait until March! All six driving wheels pressed on their axles. 10th January 2014. Photos John Besley. Spring Bracket in position for drilling. 20th January 2014. Photo Tony Massau.